The HSM ProfiPack 425 offers a convenient, easy-to-use floorstanding cardboard shredder capable of perforat sheets up to 3/4". With this great shredder with a small footprint, you can save money on packing material by making your own and recycling your used cardboard. The specialized rolling cutters on the ProfiPac 425 perforate, pad, and cut the cardboard to the proper size and then the cutting cylinders process it into packing material. Designed for convenience, any small to large business or distribution center will greatly benefit from using the Profi Pack 425 to save costs on purchasing packing material. If you are looking to shred cardboard and/or make your own packing material, the HSM ProfiPack425 is the ideal cardboard shredder for you. Please fill out the HSM Power Configuration Form in order for us to process your order smoothly. Dimensions: 27-1/2" x 19" x 38"
Welcome to MyBinding video. 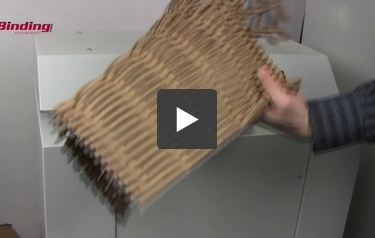 Let’s take a quick look at the ProfiPack 425, a cardboard shredder by HSM. This shredder is a convenient easy to use floor-standing cardboard shredder capable of perforating sheets up to ¾ of an inch thick. It runs on 3-phase power and has only 1 switch for operating. In short, strong and powerful. The shredder product comes out the back side in one continuous stream. It’s perfect for your recycling needs and can save you plenty of money on packing materials simply by taking old cardboard, used and unused and turning it into very useful packing material. Designed for convenience, any small to large business or distribution center will greatly benefit from ProfiPack 425. For more demos, reviews and how to’s, check out MyBinding.com. Tired of paying to recycle old cardboard? Think shipping materials are too expensive? Then the HSM ProfiPack 425 Cardboard Shredder is for you. This efficient device takes old cardboard and outdated newsprint and turns it into useful packaging material. This machine is so cost-effective that it will pay for itself in no time at all. In addition, it offers uncomplicated use and a warranty backing. Here is a closer look at the strengths and weaknesses of the ProfiPack 425. Use of this machine is simple even for the most inexperienced users. A single switch controls on, off, and reverse operations. If your cardboard piece is too wide to fit, the machine will trim the edge for you automatically. Need a specific size? There's a built-in ruler to help with that. And since very little dust is produced, you won't have to worry about constant clean-up. If you're sensitive to dust particles, a vacuum system can be attached to take care of it for you. The powerful, specially adjusted motor provides long periods of high volume use. A thermal fuse protects the engine from overheating. Innovative, solid steel rollers can perforate, pad, and cut materials to the proper size and then slice them into packing material. Since this happens in only one pass instead of two or more, you'll be able to shred twice as much material in the same amount of time. Two or three layers of cardboard can shred at once through the 3/4" tall opening. The 16.75 inch wide feed slot neatly trims the excess for later shredding and eats the current piece as fast as 39 feet per minute. The blades are sturdy enough to handle small metal pieces that may get mixed in, such as staples and paperclips. Pliable pallets remain and protect even sensitive items during shipment. HSM guarantees the craftsmanship of the cutting shafts with a ten year warranty. The rest of the shredder carries a one year warranty on parts and labor. At 386 pounds, this is a heavy piece of machinery. However, there are casters on the bottom for extra portability, allowing you to roll it around a warehouse or large office. We don't think weight will prove to be a big problem for most users. This machine doesn't have a waste bin to catch the pallets created. Many users simply place a box or other container behind the device to collect the shredded cardboard. If you're looking for an all in one device, the Intimus PacMate has an integrated bag frame but offers less capacity than the ProfiPack 425. The ProfiPack 425 is easy to use and takes no time at all. It would work especially well in a warehouse setting, large businessHealth Fitness Articles, or in a shipping center. The combination of simple operation and powerful blades results in an efficient and convenient shredder that will save you both time and money. Any place looking to reduce recycling and shipping costs while still being able to package secure items will greatly benefit from the ProfiPack 425. Get yours now and start shredding today! What about staples and tape on the boxes? Will those need to be removed or can the shredder handle them? Thank you for your question. Putting staples or tape through this machine is not recommended by the manufacturer. Does the HMS profi pac 425 cardboard shredder go in reverse in case of a jam? Yes, it does have reverse. I do have a lot cardboard to shred but I as well have paper, I was wondering if this would do paper? These shredders are really not designed for shredding paper and don't really provide the security that you will probably want when shredding documents. They are designed to produce packing materials out of used or recycled cardboard helping your warehouse operation to cut costs.